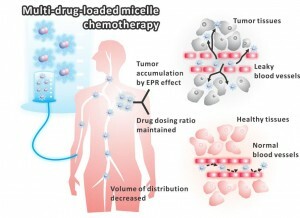 We have developed Triolimus, a novel nanomedicine composed of a non-toxic micellar vehicle capable of carrying multiple anti-cancer agents at efficacious concentrations (Fig.2). Moreover, we have validated this system in mouse models of angiosarcoma, NSCLC and breast cancer. Our Preclinical studies demonstrate that our ability to eliminate toxic drug carriers while simultaneously delivering multiple, cooperative drugs minimizes harmful side effects and maximizes therapeutic effects and strongly support advancement of this novel nanomedicine into human trials. We anticipate the oncologic community will enthusiastically embrace this technology and that it will rapidly replace less efficacious, less safe, and more complex conventional combination chemotherapy regimens in clinical practice.